Sometimes I get asked how well momentum has done the past year. If I am in a snarky mood that day, I’ll respond, “What will that tell you?” The truth of the matter is that, in most cases, short-term performance is indistinguishable from noise. 1) Why does momentum investing make sense? What is the economic rationale behind it? 2) Why might momentum investing continue to outperform in the future? 3) What are the possible drawbacks to momentum investing? 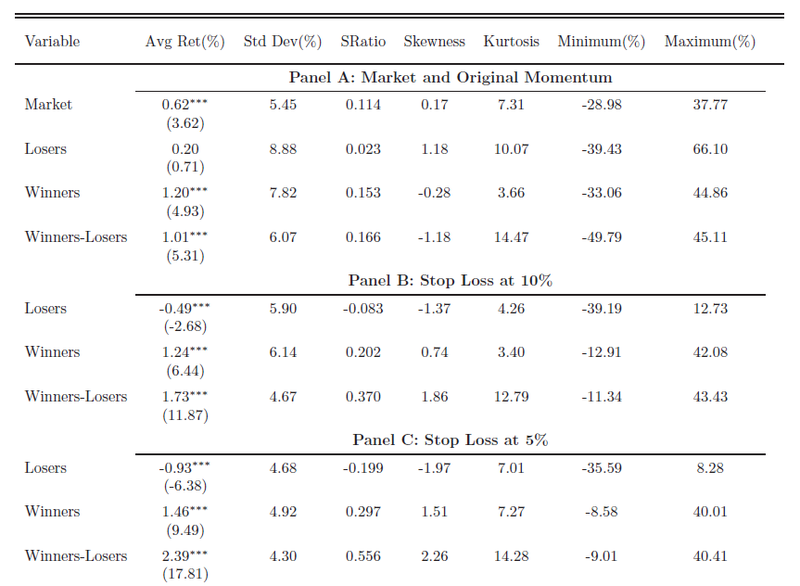 4) Are momentum results robust, consistent, and persistent? Let us examine the answers to these questions one at a time. Until the 1990s, most academics did not accept momentum due to the efficient market hypothesis (EMH). EMH said that nothing could consistently beat buy-and-hold. 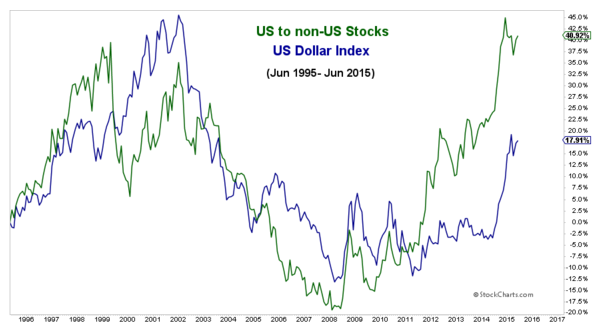 In the 1990s, Lo and MacKinlay and others showed that stocks have positive autocorrelation (serial correlation). This meant that stock returns are trending, which contradicts the EMH and opened the door for momentum researchers. In 1993, Jegadeesh and Titman issued their seminal study demonstrating the effectiveness of relative strength price momentum with U.S. stocks. Almost immediately, researchers began searching for reasons that could explain why momentum worked so well. The most cogent explanations were based on behavioral factors, such as anchoring, herding, and the disposition effect. These can cause stocks to underreact on a short-term basis and overreact longer term. Chapter 4 of my book explores this in more detail. No one knows precisely which factors cause momentum to work so well, but there are a number of viable explanations for it. 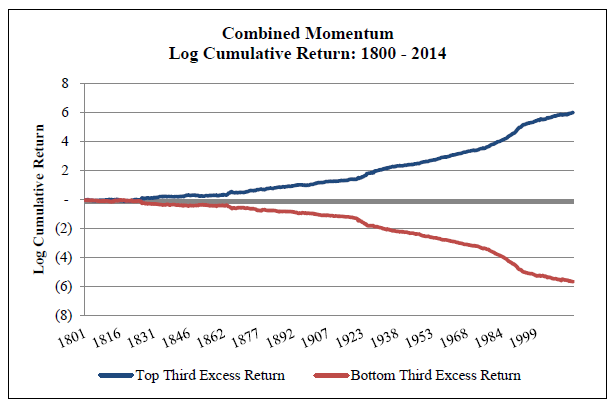 There is no longer any doubt that momentum does offer superior risk-adjusted returns. I also point out in my book that behavioral factors, such as herding, are ingrained in our DNA. They are not easily changed, and they create formidable limits to the arbitraging away of extraordinary momentum profits. Furthermore, there are plenty of non-momentum investors out there, such as value seekers, fundamentalists, buy and holders, etc. Both relative and absolute momentum are based on autocorrelation, which is trend following. Relative momentum looks at an asset's trend compared to other assets, while absolute momentum looks at an asset's trend compared to its own past. There is so much prejudice against trend following that momentum may have trouble ever attracting the attention it deserves. There are four perceived drawbacks to momentum investing. First are the so-called "momentum crashes" that occur on the short side of long/short momentum portfolios when stocks rebound sharply at bear market bottoms. In practice though, few investors actually use long/short momentum portfolios. The second potential problem is the increased left-tail risk (drawdown) associated with relative strength momentum. This can be overcome by using both absolute (time-series) and relative momentum together as dual momentum. 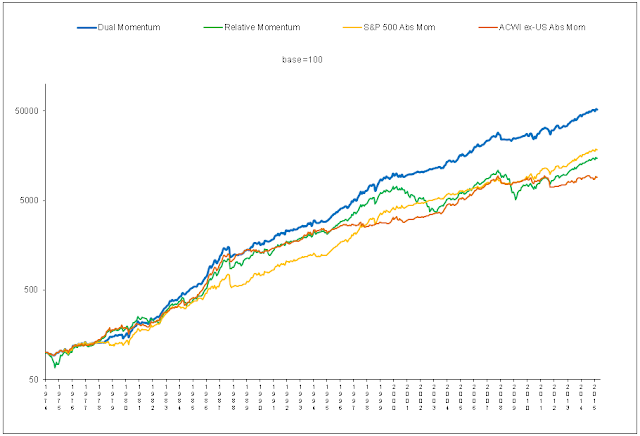 Absolute momentum not only improves risk-adjusted returns, but it can dramatically reduce left-tail risk. The third potential problem is its high turnover and associated transaction costs when relative momentum is used with individual stocks. This can be overcome by using index, asset class or sector ETFs instead of individual stocks. By doing that, one can capture attractive momentum profits while greatly reducing transaction costs. The fourth problem is the underperformance of absolute momentum during bull markets.This happens when absolute momentum gets out of the stock market prematurely and has to reenter at a worse price, or when absolute momentum misses out in participating at the beginning of a bull market. This tracking error can be offset with enhanced profits from relative momentum if one uses a dual momentum approach. 1) How simple and straightforward is the model? Simpler means there is less chance of over fitting and mining the data, which may give spurious results. Momentum is simple. It has only one main parameter, the look back period. It also works best with simple portfolios. 2) How well does the model hold up when its parameter values change? Momentum works especially well over look back periods ranging from 6 to 12 months. 3) How well does the model hold up when applied to other markets? Momentum is effective with and across many different asset classes, including U.S. stocks, non-U.S. stocks, industries, global sectors, country indices, bonds, commodities, currencies, and real estate. 4) How stable are the model parameters over time? How consistent are the results? 5) How has the model performed on out-of-sample data? 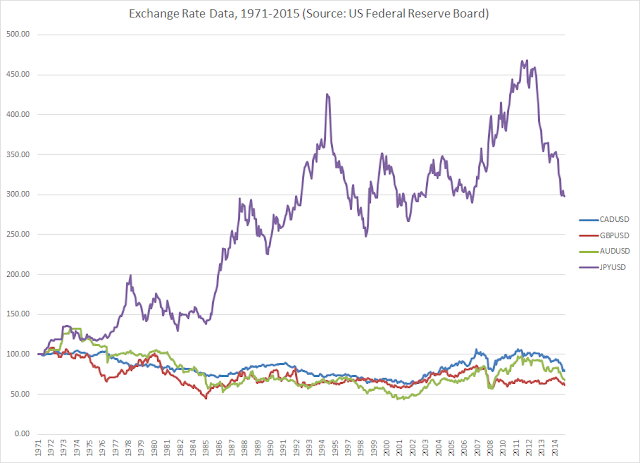 How far back does the data go? These are the most important factors, and we will devote the rest of this report to that topic. The Cowles and Jones study showed momentum earning extraordinary profits with U.S. stocks from 1920 through 1935. The Jegadeesh and Titman study corroborated the research by Cowles and Jones and included a longer test period from 1962 through 1989. Since Jegadeesh and Titman's paper in 1993, there have been dozens of studies validating momentum on new data and additional asset classes throughout the 1990s and 2000s. Several years ago, Ken French added momentum to his online data library allowing researchers to further validate U.S. stock momentum back to the year 1927. One study was by Israel and Moskowitz (2012). The authors found that long-only momentum produced an annual information ratio almost three times larger than value or size. The momentum premium was positive and statistically significant in every 20-year period through 2011. Going back further in time, Chabot et al. (2009) showed that abnormal stock momentum profits held up well going back to 1866 in Victorian England. In 2013, the longest back test yet of relative strength momentum was by Geczy and Samonov in their paper “212 Years of Price Momentum - The World’s Longest Back test: 1801-2012”. The authors showed that U.S. stock momentum premium remained positive and statistically significant throughout the 212 years of their data. The equally weighted top third of stocks sorted on momentum outperformed the bottom third by 0.4% per month (t-stat 5.7). Momentum profits were higher than buy-and-hold in 19 of 21 decades. 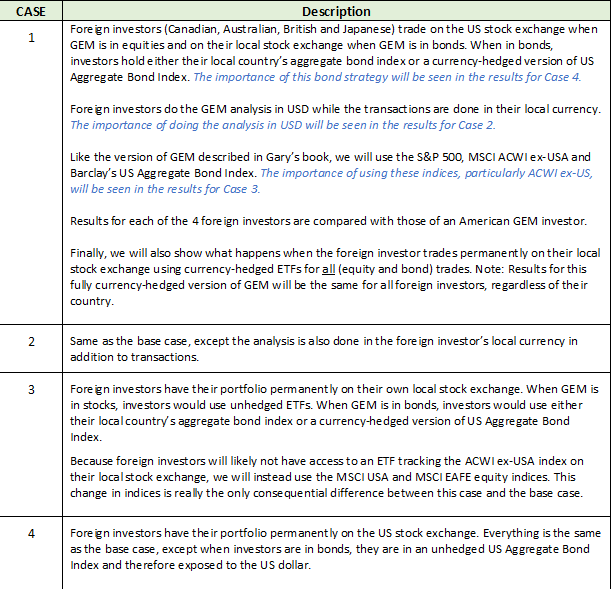 In their most recent paper, “215 Years of Global Multi-Asset Momentum: 1800 – 2014 Equities, Sectors, Currencies, Bonds, Commodities, and Stocks”, Geczy and Samonov (2015) extended their earlier work to include a 215-year history of multi-asset momentum with six different asset classes. They found the momentum premium to be significant in every asset class, across asset classes, and in combination with each other. 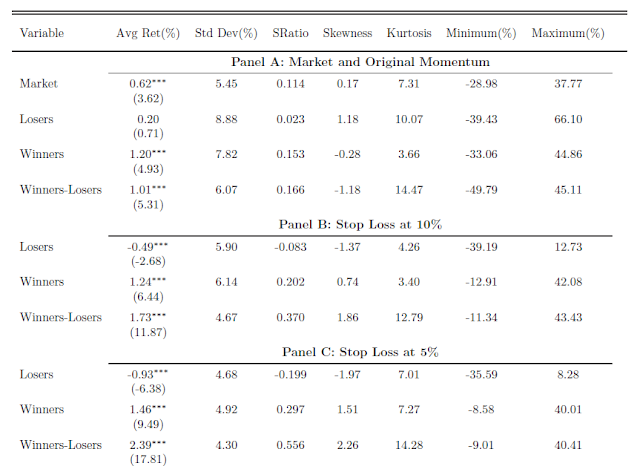 Momentum worked best with geographically diversified stocks indices. This is how we use relative momentum. The authors also found significant abnormal profits applying absolute (time-series) momentum to the same data. During the past 25 years, there is nothing in finance that has been so extensively researched as price momentum. If academics were going to discard the EMH, they wanted a mountain of evidence before doing so. As practitioners, we are fortunate to have this much validation showing the consistency and effectiveness of momentum, not to mention all the other indications of robustness. The best due diligence one can do on momentum investing is to read the above referenced research papers and some of the others available on the Social Science Research Network (SSRN). You could also read the studies referenced in my book. Rigorous and extensive research has shown that momentum offers superior risk-adjusted returns. It is the strongest known anomaly. 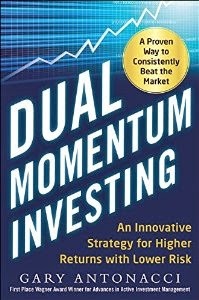 See my book on Dual Momentum Investing or my research paper on absolute momentum. There are other long-term studies validating trend following absolute momentum. Greyseman and Kaminski (2014), for example, show that trend following has outperformed buy-and-hold with less drawdown back to the 13th century. The word “momentum” appears in the titles of 667 SSRN papers.